In the photo from L-R is Dr Frederic Martin, Co-President of IDEA and Mr. Ronald Jackson, Executive Director of CDEMA with other awardees. The Caribbean Disaster Emergency Management Agency (CDEMA) is the recipient of a Silver Medal award which is shared with the Institute for Development in Economics and Administration (IDEA International). 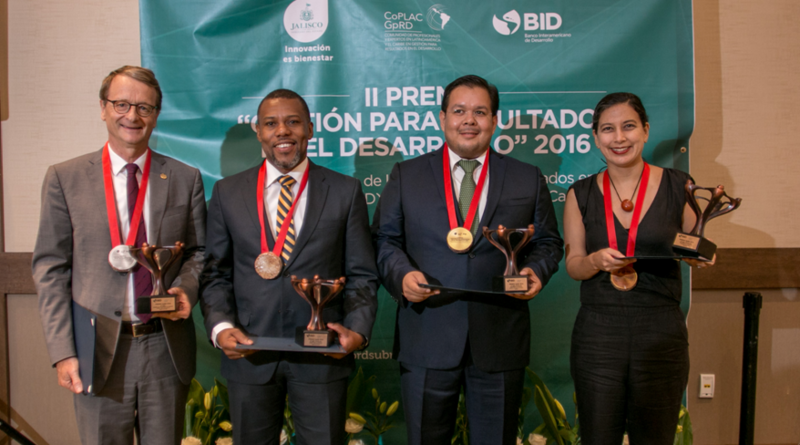 The award was sponsored by the International Development Bank (IDB) and presented during the IX International Seminar of the Sub-National Governments Network (CoPLAC) held in Guadalajara, Jalisco, Mexico on 8 September 2016. Both entities were nominated for the ‘Second Competition in Management for Development Results (MfDR)’ and were placed second in the ‘MfDR in Sectors’ category. The Executive Director of CDEMA, Ronald Jackson, and the Co-President of IDEA, Frederic Martin, expressed their gratitude for the recognition. Dr Martin said he was particularly “pleased that the CoPLAC Evaluation Committee had recognized this example of good practices in MfDR in the Caribbean region conducted with limited human and financial resources, as well as of the originality of the institutional setup based on North-South collaboration and public-private partnership”. Mr Jackson also commended the organizers and sponsors of the award and offered assurance that “CDEMA remains committed to strengthening its accountability to stakeholders through monitoring, evaluation and reporting (MER) for both, its internal work and external partners’ work”. “Being awarded this Silver Medal on the occasion of celebrating our Silver Anniversary is highly commendable and speaks to the growth of the Agency over the past 25 years in ensuring that M&E is highly featured in our efforts to be accountable to our Participating States and stakeholders as we report on progress towards the achievement of the Regional Comprehensive Disaster Management (CDM) Strategy 2014-2024 and the CDEMA Coordinating Unit (CU) Corporate Plan 2014-2017”, said Mr Jackson. In 2013, the CDEMA CU contracted the IDEA International Institute to provide support to strengthening the MER capacity of the Agency to lead the CDM agenda for the region. The project undertaken by IDEA started with a series of training in Monitoring & Evaluation (M&E) of a critical mass of key actors, both at CDEMA CU and in major National Disaster Offices. Twenty one participants achieved the Masters Certification Programme in M&E and Information Systems, a graduate level credited programme offered jointly by IDEA International and University Laval, Canada. Further work on the M&E system involved the revision of the strategic and operational plans, adjusting when necessary the choice of indicators in the Performance Measurement Framework, and checking for the consistency of targets set at strategic, programmatic, and operational levels over the planning horizon of the CDM Strategy. The development of such a robust system also includes efforts to strengthen M&E at the level of the National Disaster Management Organizations. And finally, the initiative was accompanied by the design and implementation of an online monitoring system, which started with a diagnostic of needs and of relevant existing information systems, and then included the adaptation of the generic IDEA Solutions “Monitoring for Results” (M4R) software to the specific needs and characteristics of CDEMA to develop a tailor-made solution, which is currently functional as CDM Monitor. Based on the support given by IDEA, the CDEMA CU has seen an improvement over the last 3 years in its internal systems in terms of monitoring and reporting of results. The CU is also providing support to the Participating States and to stakeholders within the CDM Governance Mechanism in order to improve the level of reporting on progress of implementation of the CDM Strategy.